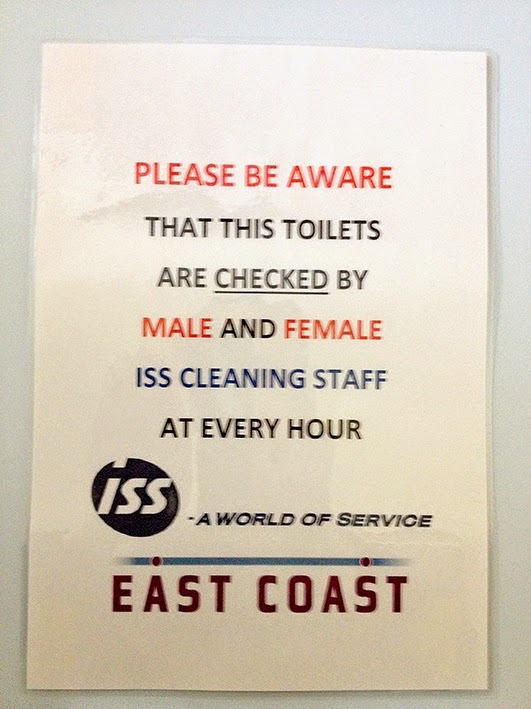 We have Jon C to accuse thank today for this photo which he took in the loo at Peterborough railway station. It's been quite some time since we visited Peterborough, the typo centre of the UK. I almost miss the place. Almost. Anyway, I find it amusing that the cleaning staff make their hourly checks (the emphasis must be important) as couples which, with it being Peterborough, I guess must amount to double-Czechs. But it's not so much the content that makes me laugh. No. It's more the obvious camera shake. Reflecting, as it does, the fact that Jon C was in a hurry to take the picture as he was terrified of being caught lurking in a toilet taking photographs. So he snapped it as quickly as he could. In fact, he tells me his photo session was as quick as a flash. And I have no reason to doubt his comparison.